- La gran apuesta (The Big Short), de Adam McKay. - El puente de los espías (Bridge of Spies), de Steven Spielberg. - Mad Max: Furia en la carretera (Mad Max: Fury Road), de George Miller. - Marte (The Martian), de Ridley Scott. - El renacido (The Revenant), de Alejandro González Iñárritu. - La habitación (Room), de Lenny Abrahamson. MEJOR DIRECTOR (Best Achievement in Directing):- Adam McKay por La gran apuesta (The Big Short). - George Miller por Mad Max: Furia en la carretera (Mad Max: Fury Road). - Lenny Abrahamson por La habitación (Room). - Tom McCarthy por Spotlight. 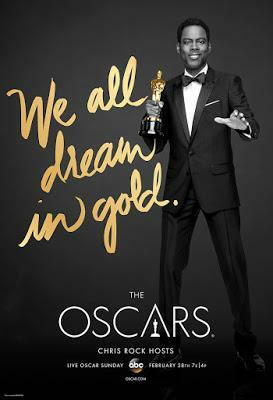 MEJOR ACTOR (Best performance by an actor in a leading role):- Bryan Cranston por Trumbo. - Matt Damon por Marte (The Martian). - Michael Fassbender por Steve Jobs. - Eddie Redmayne por La chica danesa (The Danish Girl). MEJOR ACTRIZ (Best performance by an actress in a leading role):- Cate Blanchett por Carol. - Jennifer Lawrence por Joy. - Charlotte Rampling por 45 años (45 Years). - Saoirse Ronan por Brooklyn. MEJOR ACTOR DE REPARTO (Best performance by an actor in a supporting role):- Christian Bale por La gran apuesta (The Big Short). - Tom Hardy por El renacido (The Revenant). - Mark Ruffalo por Spotlight. - Sylvester Stallone por Creed. MEJOR ACTRIZ DE REPARTO (Best performance by an actress in a supporting role):- Jennifer Jason Leigh por Los odiosos ocho (The Hateful Eight). - Rooney Mara por Carol. - Rachel McAdams por Spotlight. - Kate Winslet por Steve Jobs. MEJOR GUIÓN ORIGINAL (Best Writing Original Screenplay):- Matt Charman, Joel & Ethan Coen por El puente de los espías (Bridge of Spies). - Alex Garland por Ex Machina. - Pete Docter, Meg LeFauve y Josh Cooley por Del revés (Inside Out). - Jonathan Herman y Andrea Berloff por Straight Outta Compton. MEJOR GUIÓN ADAPTADO (Best Writing Adapted Screenplay):- Charles Randolph y Adam McKay por La gran apuesta (The Big Short). - Nick Hornby por Brooklyn. - Phyllis Nagy por Carol. - Drew Goddard por Marte (The Martian). - Emma Donoghue por La habitación (Room). - A War (Krigen) - (Dinamarca). MEJOR PELÍCULA DE ANIMACIÓN (Best Animated Feature Film):- Anomalisa. - El niño y el mundo (O Menino e o Mundo). - La oveja Shaun. La película (Shaun the Sheep Movie). - When Marnie Was There (Omoide no Mânî). MEJOR MONTAJE (Best Film Editing):- La gran apuesta (The Big Short). - El renacido (The Revenant). - Star Wars: El despertar de la fuerza (Star Wars: The Force Awakens). MEJOR FOTOGRAFÍA (Best Cinematography):- Ed Lachman por Carol. - Robert Richardson por Los odiosos ocho (The Hateful Eight). - John Seale por Mad Max: Furia en la carretera (Mad Max: Fury Road). - Roger Deakins por Sicario. 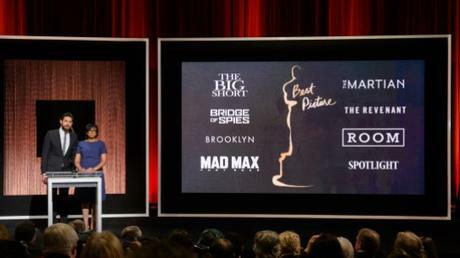 MEJOR DISEÑO DE PRODUCCIÓN (Best Production Design):- El puente de los espías (Bridge of Spies). - La chica danesa (The Danish Girl). MEJOR MAQUILLAJE (Best Makeup and Hairstyling):- Mad Max: Furia en la carretera (Mad Max: Fury Road). - El abuelo que saltó por la ventana y se largó (Hundraåringen som klev ut genom fönstret och försvann). MEJOR DISEÑO DE VESTUARIO (Best Costume Design):- Carol. MEJOR BANDA SONORA (Best Music - Original Score):- Thomas Newman por El puente de los espías (Bridge of Spies). - Carter Burwell por Carol. - Johann Johannsson por Sicario. - John Williams por Star Wars: El despertar de la fuerza (Star Wars: The Force Awakens). MEJOR CANCIÓN (Best Music - Original Song):- Earned It por Cincuenta sombras de Grey (Fifty Shades of Grey). - Manta Ray por Racing Extinction. - Simple Song #3 por Youth. - Til It Happens To You por The Hunting Ground. MEJOR EDICIÓN DE SONIDO (Best Sound Editing):- Mad Max: Furia en la carretera (Mad Max: Fury Road). MEJOR SONIDO (Best Sound Mixing):- El puente de los espías (Bridge of Spies). MEJORES EFECTOS VISUALES (Best Visual Effects):- Ex Machina. MEJOR PELÍCULA DOCUMENTAL (Best Documentary – Feature):- Amy. - The Look of Silence. - What Happened, Miss Simone?. - Winter on Fire: Ukraine's Fight for Freedom. MEJOR CORTOMETRAJE DOCUMENTAL (Best Documentary – Short Subject):- Body Team 12. MEJOR CORTOMETRAJE (Best Live Action Short Film):- Ave Maria. - Everything Will Be Okay (Alles Wird Gut). MEJOR CORTOMETRAJE DE ANIMACIÓN (Best Animated Short Film):- Bear Story. - We Can’t Live without Cosmos.